Just a simple, casual look for today, but one that I'm loving! This top is so easy to just throw on and go and I love the side slit detail. Pairing lace up flats with destroyed jeans is always a favorite of mine, too. Combining the opposites make for a super-chic look! The HIGH most days is around 19-22!! I don't even know if I can pack adequately for that! I guess we'll see. Until then, have a great rest of your week, lovelies! Loving the gold accessories! You always make simple outfits look so amazing!! love more casual looks on you!! Love this look! 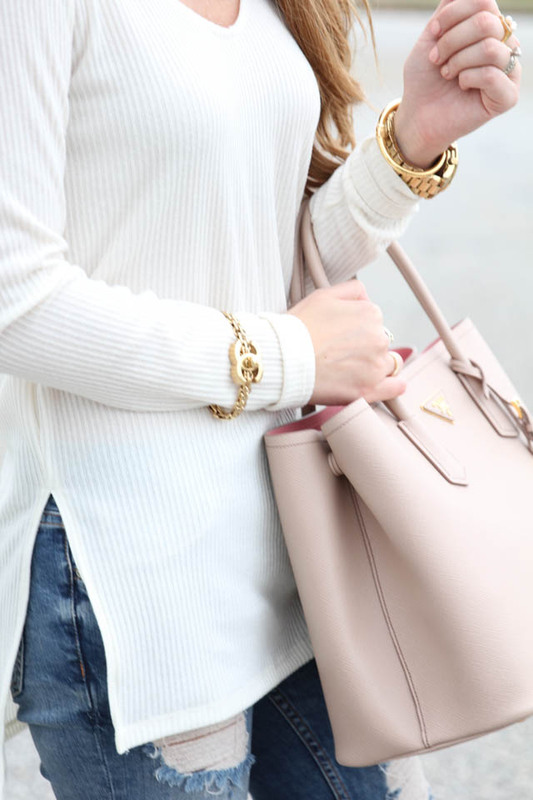 This is such a perfect, casual sweater! This is a perfect pair of trashed jeans! You're looking beautiful in this casual combo! Loving the high slit on that sweater, great price too! Such a simple yet chic look, that top is a perfect versatile piece. Sweet casual look! Love the soft colors! I love this look! That sweater is so beautiful & interesting & it goes so perfectly with ripped jeans & lace-up flats. Love the sweater! What a great piece to have in your wardrobe.